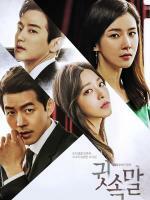 Whisper is a 2017 South Korean television series starring Lee Bo Young, Lee Sang Yoon, Kwon Yul and Park Se Young. Shin Young-Joo (Lee Bo Young) is a female detective with charisma and Lee Dong Joon is a righteous judge. They uncover corruption at the nation's biggest law firm Taebaek. Shin Young Joo (Lee Bo Young) is a police detective who is fired for leaking information to the press when her father, Shin Chang Ho (Kang Shin Il), is framed for murder and sent to prison for 15 years. Lee Dong Joon (Lee Sang Yoon) is the righteous judge who was forced to find Chang Ho guilty in his last deed as a judge before being disrobed and strong-armed into marrying Choi Soo Yeon (Park Se Young). Soo Yeon is the daughter of Choi Il Hwan (Kim Kap Soo), the president of Tae Baek, the most powerful law firm in the country. In his new life as a “legal thief” at Tae Baek, where he is now expected to check his morals at the door to protect rich and powerful clients, Dong Joon also is being blackmailed by Young Joo. Young Joo manages to get a video clip of Dong Joon that could ruin his life and career. She then assumes the name Jo Yeon Hwa and goes to work for Dong Joon as his legal secretary so that she can force him to help her find the real murderer in her father’s case. But when both Dong Joon and Young Joo get entangled in the power plays of Kang Jung Il (Kwon Yool), the dangerous leader of the law firm’s M&A division, can Young Joo find the justice she seeks while Dong Joon just wants to return to his upstanding life before it spiraled out of his control?